How to create happy, lifelong clients who will return again and again. Tips and techniques for creating buzz around your pet sitting business. 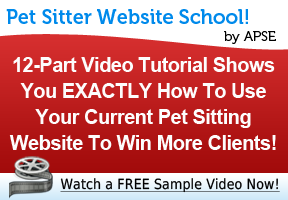 How to become the one and only pet sitting service your market WANTS to work with. The sure-fire way to virtually eliminate the competition. 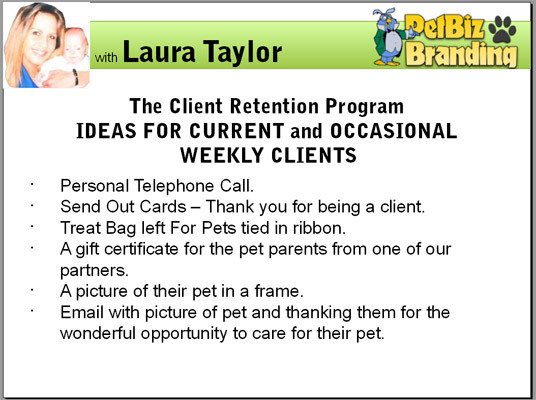 Laura Taylor is the founder and owner of Parrot ‘n’ Pet Sitting Services located in Whitby, Ontario. Her business grew into a 6 figure operation after just 18 months of hard work, networking and perseverance and now has 9 employees and growing – but growing through what she calls “Creative Marketing Development” which she will share with APSE members in her articles and publications. Laura is also the founder and main web designer of the newly launched PetBiz Branding focusing on creating CMS pet websites and pet blogs using WordPress and specializes in web hosting for pet businesses as well as creating articles supporting pet business growth through more creative website development ideas. 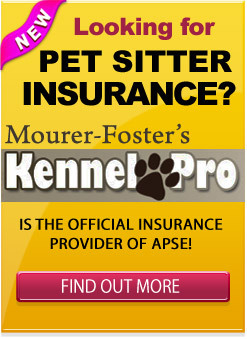 Lastly, Laura is also one of the co-founders of the former company – The Business Of Pet Sitting, LLC. Laura is known as a “Creative Director” who thinks and creates Pet Business Marketing Ideas out side -of- the- box. Laura believes in constantly re-inventing yourself as a entrepreneur and pursuing differentiation between yourself and other pet businesses and strives to create unique ideas and creative marketing concepts that help to distinguish the pet business owner from it’s competition and has a high belief in client retention programs.